bring in a wise and wise-cracking facilitator to get your group laughing and learning on their feet! to bring laughter and learning to keynote audiences throughout New England. 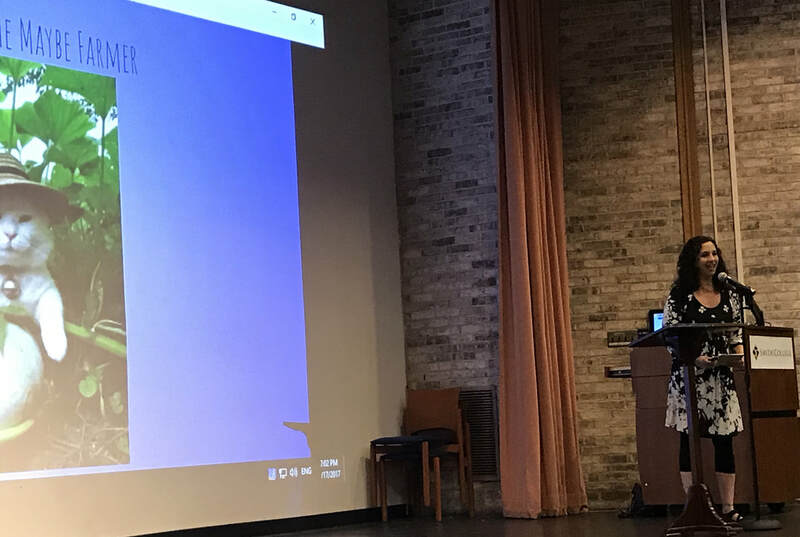 "Pam's talks and presentations are always crowd-pleasing- from high school students to adults - everyone can learn from the lessons she pulls out of improv." In her signature interactive keynote address, Pam Victor shows you how to identify your voice of unhelpful judgment and "swipe left" on it - a polite "thanks but no thanks" in dating app terms. This funny, relatable interactive talk experience provides five effective techniques for quieting that voice so you can live and work with more resilience, authenticity, joy, and ease. Interactive exercises include the whole audience in order to make the learning more personal, powerful, and fun. Ask yourself this: How would your life change if you stopped listening to the voice preventing you from realizing your dreams? Workforce Training Fund Express Grant. ​get more information and apply! What would you say if you heard that there are two "magic words" that could transform innovation in your professional life and personal creativity? In this interactive talk experience, Happier Valley Comedy's Head of Happiness Pam Victor explores the two magic words of improv that can increase beneficial risk-taking, pure creativity, and delicious brainstorming ... and we get to do it all in an hands-on talk with fun and active exercises that provide practical skills to stimulate innovation through laughter. Shhhhh! 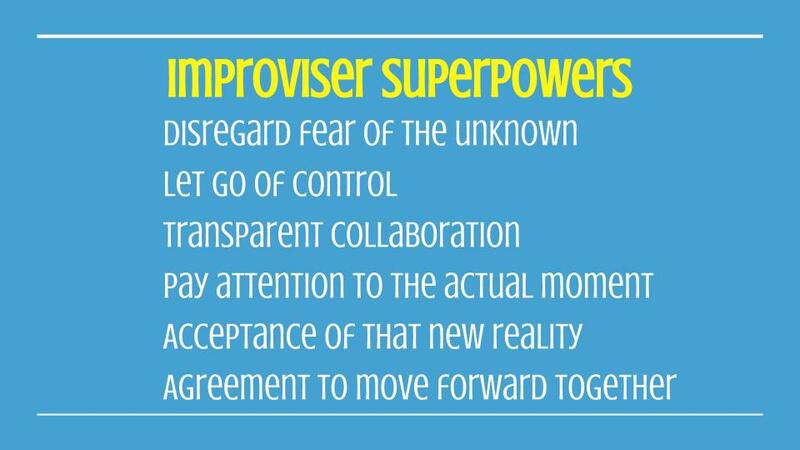 Don’t tell anyone this secret: In this interactive presentation, Pam Victor shares the exclusive collaboration superpowers that allow improvisers to create comedy out of thin air, so you can use these trade secrets for building stronger collaborative, team-focused progress at work. This presentation provides hands-on experience with why we overuse “no” that restricts progress, and how we can get to “yes” in order to move forward together as a happy team. Through humorous stories and impactful interactive exercises, you gain valuable tools for how to progress at work with more positivity and true cooperation in order to increase staff empowerment, conflict-resolution skills, and productive team spirit. Let’s learn how improv superpowers can improve brainstorming sessions, getting to win-win, and promoting creative problem-solving … and we get to do it all through laughter! “It is a happy talent to know how to play.” So says Ralph Waldo Emerson. Not only that but play keeps you healthy. According to data researcher Brene Brown’s findings, wholehearted people goof off. (Yes, “goof off” is the scientific term used by Dr. Brown.) When is the last time you goofed off, just done something for the pure fun of it? As adults, so often we’ve forgotten the art and joy of real play. In this interactive presentation, Happier Valley Comedy founder and professional improv comedian Pam Victor brings the audience on a laughter-filled exploration of play: How can we learn how to play again? What’s stopping us from having more fun? And the question the audience will be asking at the end of the presentation: Can we play that game again please? !